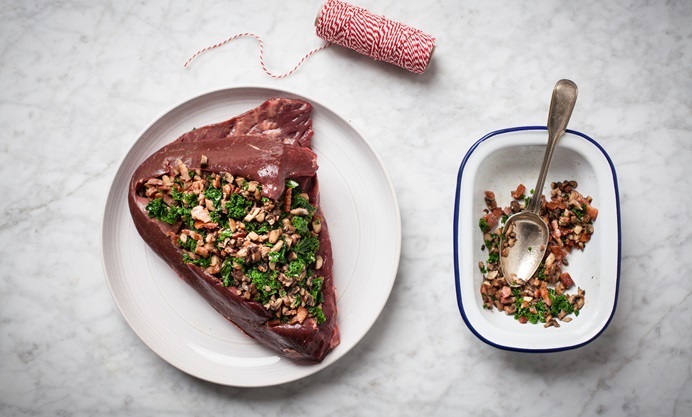 Regula Ysewijn revisits an old English classic – roasted ox heart – which she updates with a delicious stuffing of kale, bacon and mushrooms. 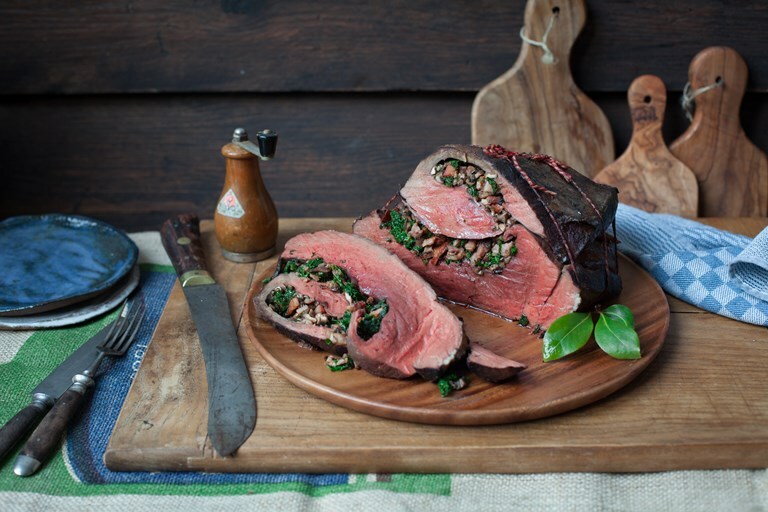 Heart is one of the cheapest cuts of meat available today and makes a fantastic alternative roast dinner. Eat your heart out. Let us start with a pun and get it over with! I guarantee you that this will be the most surprising dish you will make this year, plus it is great way to impress your guests. 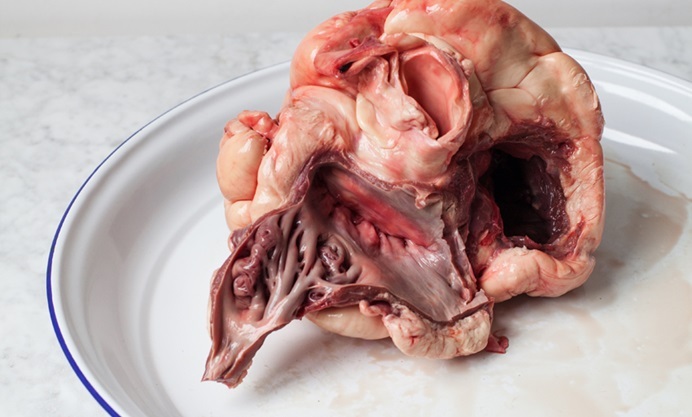 And with Valentine’s Day approaching, what better cut of meat to explore than the heart. 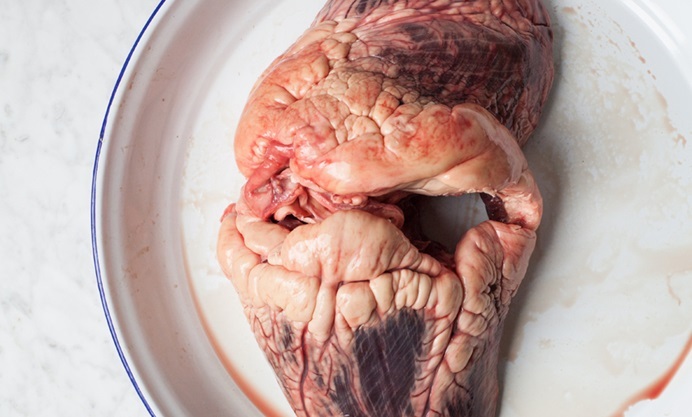 Heart is quite commonly eaten in Peru, but it might surprise some of you that is was also eaten in England for centuries, before it became associated with offal and then neglected. 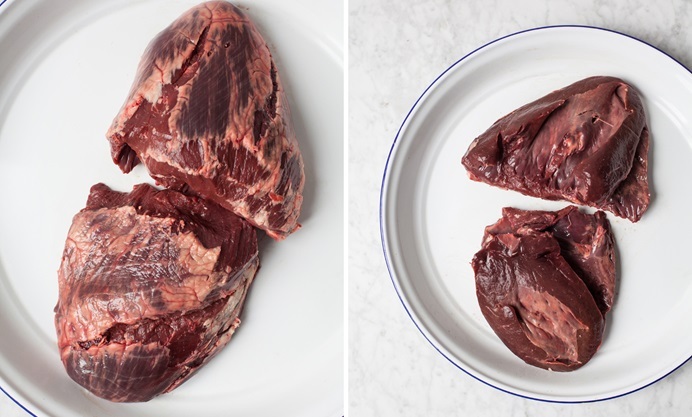 Beef heart is so unpopular that I get mine from a local farm for as little as £3, and fellow Great British Chefs contributor Victoria got hers for £7.50/kg from a posh London butcher. That is great value for a huge piece of meat. 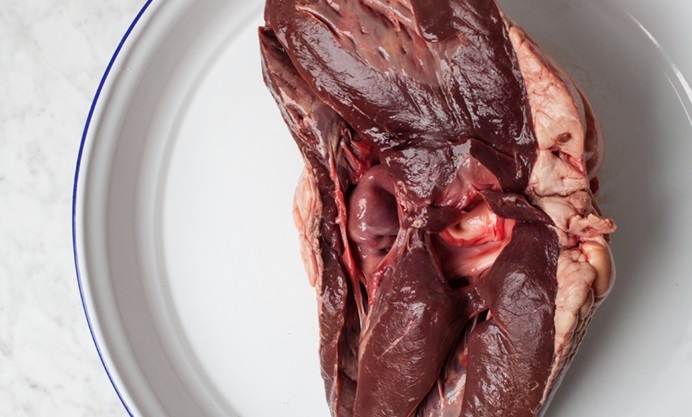 In Peru they make kebab-style roasted heart like this recipe from Victoria, in England beef heart was usually stuffed with forcemeat. To make the dish slightly lighter I opted for a duxelle, which is a mixture of mushrooms, bacon and kale. 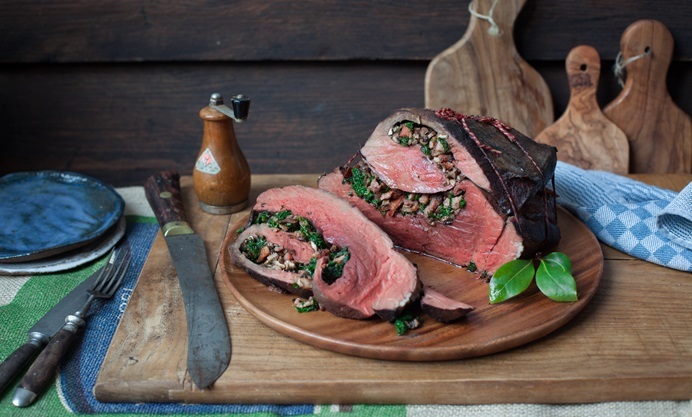 The flavour of the heart is very beefy so there will be great flavours in this dish. 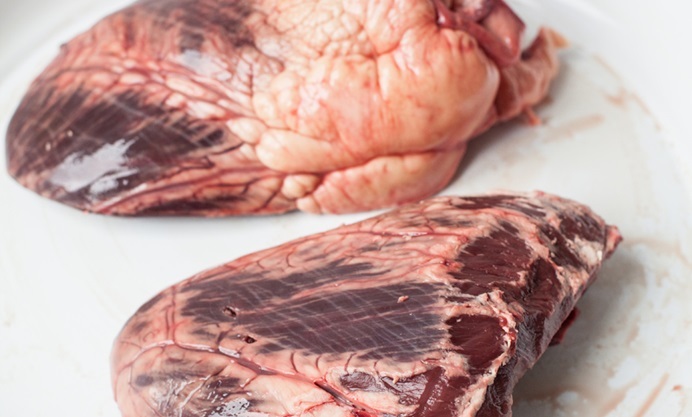 It is a muscle so it has many similarities with steak, though it contains far more protein. It is actually quite nutritious as it is packed with other vitamins as well. 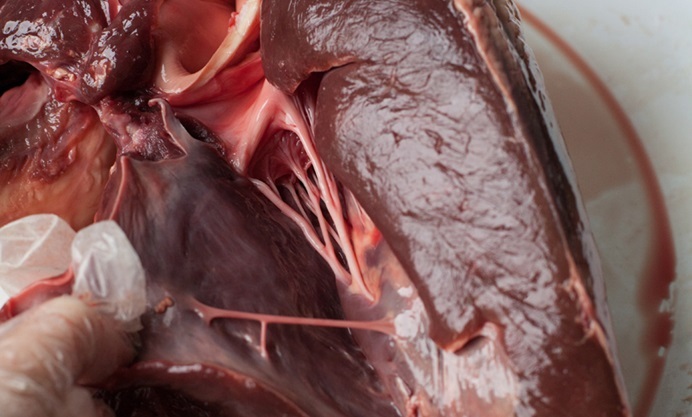 The heart should be a deep brownish red with a large amount of yellow fat on the top. The fat looks a lot like kidney fat – which is suet – although it can not be used in the same way. In this day and age it becomes ever more important to eat from nose-to-tail. It is not a food fad, it is common sense. So give heart a go. 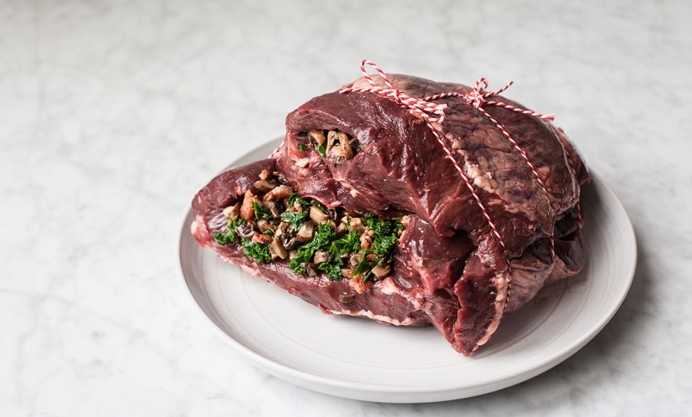 Ask your butcher to trim it for you if you aren’t up to the task, you can always try it yourself when you prepare it next time. On the inside of the heart, remove the stringy parts shown in the photo. If the heart still has a piece that looks a bit like a windpipe, also remove this.